Did you know that DJ Khaled used to be a ball boy for the Orlando Magic? Did you also know that he used to hustle his mixtapes to the team’s players– like Shaquille O’Neal? Probably not because he’s never talked about it before. Thankfully, my good friend, professional basketball player Hasheem Thabeet, gave me the inside scoop while we were going through the drive thru at In-N-Out on Sunset. A short time later, during my tenure at REVOLT TV, I found myself sitting in front of him for an interview. For a long time, I thought that interview had been lost, but it was miraculously recovered and sent my way. Now, I’m unleashing it on the internets. It’s only right. Sama’an with DJ Khaled. Photo by Tuma Basa. DJ Khaled is my fellow countryman– we’re both Palestinian; to the best of my knowledge, Khaled’s family is from the village of Al-Bireh (if someone has better facts than me, please let me know) which neighbors the city of Ramallah— where some of my family currently reside. As my career progresses, my dad consistently stresses the importance of Arabs occupying spaces we never have before. Khaled’s presence in American pop culture is important because he presents an image of Arabs that is atypical and almost antithetical to the stereotypical images perpetuated in American cinema. One day, I’d like to sit down with him and have a talk about the culture and heritage that we share, but, for now, I’m just happy that our paths have crossed. He’s inspired half the world to take the hinges off, it seems, but I think there’s some added inspiration for Palestinians (and Arabs) who have been stereotyped literally to death for decades. We can make it, we can find success in creative industries, and we don’t have to play a terrorist to get there. I interviewed Khaled in 2014, but our paths would cross again during SXSW 2016 thanks to my closest mentor, Bun B. You can read about that story right here. That meeting led me to New York City for a taping of The Late Show with Stephen Colbert, which you can read about here. 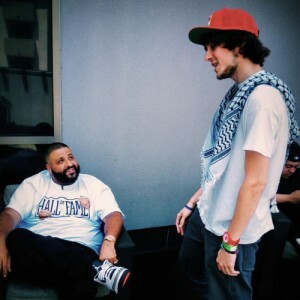 For now, check out my interview with DJ Khaled below, filmed by Alika Awana.